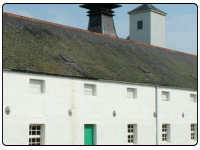 Dallas Dhu Distillery was built in 1899, but is currently not producing any whisky. It is mainly a visitor attraction now with all the distillery equipment working perfectly. The distillery is in the Speyside region of Scotland and the contact details are Dallas Dhu Distillery, Forres Morayshire, IV36 2RR and the telephone number 01309 676548.